(RT) The cost of the F-35 stealth fighter jet program may rise by another $27.5 billion, despite President Donald Trump’s assurances to fix “out of control” expenditures in the production of the most expensive jet in US history, according to a Pentagon paper. Overall acquisition costs for the advanced fighter jet could climb by $27.5 billion, to $406.5 billion, according to the latest Selected Acquisition Report submitted to Congress. The F-35 is already estimated as the costliest single project in US military history. The Pentagon’s F-35 program office earlier told Bloomberg the $27.5 billion increase was reflected in current “then-year” dollars to fund research, development, procurement and military construction. “The F-35 program remains within all cost, schedule and performance thresholds and continues to make steady progress,” Vice Admiral Mat Winter, the program’s manager, explained in a statement. The F-35 office “is committed to the delivery of cost-effective war fighting capability across all areas of the program and is aggressively pursuing affordability opportunities within our three lines of effort – Development, Production, Sustainment,” he added. According to Winter, the estimated multibillion-dollar increase was largely driven by the adjustments to the F-35’s production schedule. The US Air Force reduced its maximum rate of aircraft purchases from 80 to 60 per year, which requires the extension of planned procurements by six years, from 2038 to 2044, he said. The F-35 program has been plagued by reliability issues, major design flaws and cost overruns. Critics have warned the fifth-generation jet, marketed as a superior plane to its fourth-generation predecessors, would provide little advantage on the battlefield. In March, a new paper was released by the Project on Government Oversight (POGO), an independent nonprofit that studies corruption, misconduct, and conflicts of interest. Dan Grazier, a POGO researcher and former Marine captain, wrote in the report that the advanced jet is ineffective as a fighter, unsuitable for carrier operations and hard to deploy to ground support missions. Grazier reported that pilots were dissatisfied with the Distributed Aperture System (DAS), which allows them to see “through the jet,” calling the function “operationally unusable and potentially unsafe.” The author said that pilots often turn the system off and choose to rely on the traditional instrument panels instead. The report also predicted the costs needed to fund training and operating the aircraft within the next 50 years. The Pentagon will need to allocate $1 trillion to meet these goals, making the cost to buy and operate the F-35 at least $1.4 trillion. In the meantime, Lockheed Martin, the plane manufacturer, declined to comment on the Selected Acquisition Report. 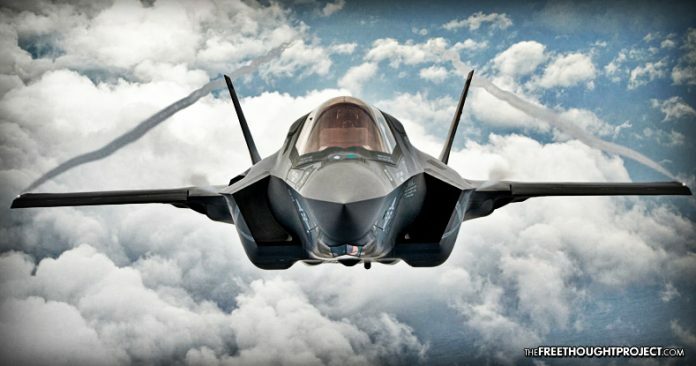 The corporation “has not had the opportunity to review the 2016 Selected Acquisition Report, but cost continues to come down on the F-35 program,” spokesman Mark Johnson told Bloomberg. In December, Trump, who was president-elect at the time, said the cost of the F-35 program was “out of control,” promising to raise the issue with Lockheed Martin executives. The F-35 comes in three versions, the F-35A, which is designed to be the smallest and lightest for the Air Force and US allies, the F-35B with short take-off and vertical landing capabilities for the Marine Corps, and the F-35C, which is designed to take off and land from aircraft carriers for the Navy.